M. Colleen Knoop—Age 93 died February 10, 2016 at home in Overland Park, KS. She was born November 26, 1922, in Cameron, Mo and moved to Olathe, KS in 1959 where she lived until 2013, when she went to live with her daughter and family in Overland Park. 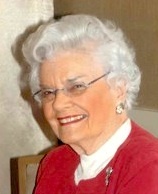 Mrs. Knoop was the clerk secretary at the Olathe Post Office until her retirement in 1984. She married H.S (Doc) Knoop on June 1, 1942 in Kansas City.He preceded her in death in 1980. Survivors include; her son, James A Knoop (Linda), Sacramento, CA, and her daughter, Mary Ann Lippert (Marty), Overland Park, KS. Grandchildren; Michael and Max Lippert, and her sister Lois M Cole, Marlton, NJ, and many other relatives and friends. She was a charter member of New Hope Presbyterian Church in America, in Olathe. Private burial will be at Spring Hill Cemetery. A memorial service will be held to celebrate her life at 11AM. Sat. Feb. 13 at New Hope PCA, 13310 S. Blackbob Rd. Olathe, KS 66062. The family suggests contributions to New Hope PCA.